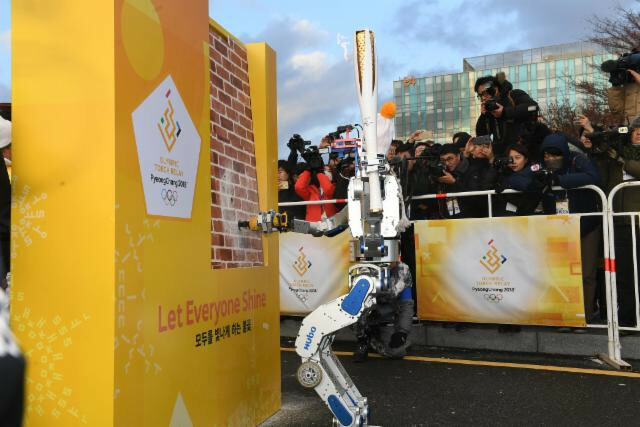 A ‘’humanoid robot’’ has carried the Olympic Torch on the latest stage of the journey to Pyeongchang. Organisers were determined: "to showcase our advances in technology." The "Hubot", named Hubo, made its appearance at the Korean Advanced Institute of Science and technology, in Daejon. This special Torch Relay leg began with Torchbearer, Professor Dennis Hong, founding director of the Robotics and Mechanisms Laboratory at UCLA, in Los Angeles, riding in an automated car. Then came the Hubot's own moment to shine when it took the flame from Professor Hong. Hubo is 120 centimetres tall, has a maximum stride of 35cm and is capable of 65 paces per minute. It even has individually moving fingers and performed what Torch Relay officials described as a "high difficulty performance" (sic) as he cut a hole through a brick wall as part of an emergency scenario. After the ‘run’ Hubo passed the flame to Dr Oh Jun Ho. He had been in charge of the mechanical engineering team which developed the robot back in 2004 . "Through the robot's participation in the relay, we were able to show people how far (South) Korea's robotic industry has developed and show people the different ways that robots can be used in the near future," he said. In turn, Dr Oh Jun Ho handed the flame to Gang Da Bin, a winner of the Junior Software Cup, who carried the Torch to represent the next generation of scientists. Pyeongchang 2018 have confirmed that around 85 robots will be deployed as volunteers during the Winter Games. Some will even help providing information for visitors. The Hubot was not the first robot to participate in the 2018 relay. An undersea robotic craft helped carry the flame in the early stages of the journey. Organisers insisted that the Torch Relay would show the future and the past . That has even meant a journey back to prehistoric times when a dinosaur skeleton at the Geological museum, in Daejon , offered an unusual backdrop for runners in the Relay. 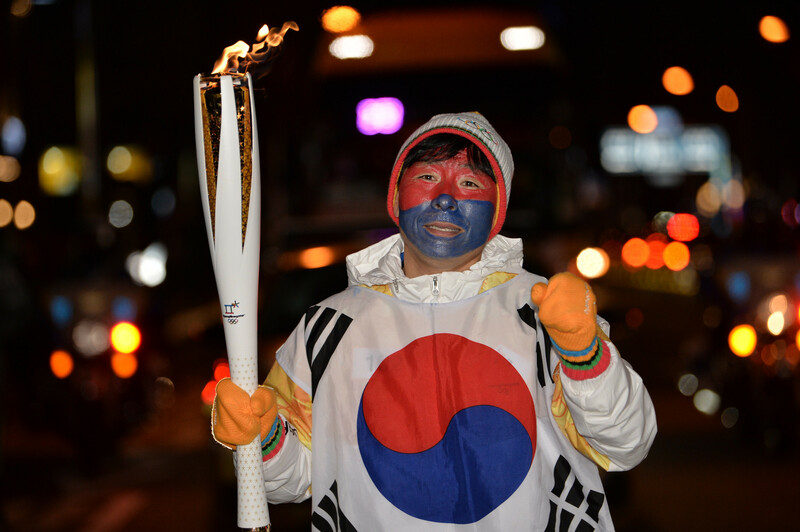 The more conventional bearers have included Kim Sung Hyun, a young dental student who has already seen the Olympic flame pass by. He was at school in Vancouver when the relay passed in 2010. “The relay was near my home, so I went to watch it. “I took a photo with a Torchbearer and always dreamed I could do it in Korea one day. “When I heard I had been picked I felt exhilarated. “I think it is a good opportunity to show my foreign friends how Korea has grown,” he said. When Suh So Huan was chosen she also received an unexpected gift. “When I told my husband, he bought me an indoor exercise bike as a present. “I have been using it to train everyday for the run,’’ she said. Former Los Angeles Dodgers baseball pitcher Park Chan Ho also carried the flame in Daejon. After almost two decades in the US he ended his career back in South Korea with the Hanwha Eagles. He handed the flame to Eagles batter Kim Tae Gyun. The arrival of the flame at the Daejon Expo Park was greeted in traditional style with girl band Mamamoo adding to an already considerable K-Pop presence and performing for the crowds.